Ryan Glasby, who has been at the Joint Institute for Computational Sciences (JICS) since June 2014, develops a computational fluid dynamics (CFD) tool for customers such as the Department of Defense (DoD) and the Department of Energy (DOE) that is robust and evolving to new computing architectures as they become available; and he helps guide CFD—and, in general, physics-based modeling applications—into supercomputing. CFD applies numerical analysis and algorithms in solving and analyzing fluid flow problems. “We benefit from having access to advanced computing resources at JICS and their potential for accelerating our code through collaborations with JICS' AACE [Application Acceleration Center of Excellence],” Glasby says. 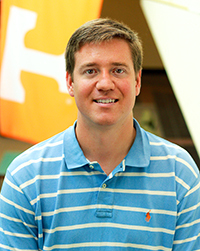 He holds a bachelor’s and a master’s degree from The Ohio State University in aerospace engineering and earned a PhD from the University of Tennessee. He spent three years at Arnold Engineering Development Complex working as a contractor in the CFD applications group. Glasby and colleague, Taylor Erwin, have had numerous papers published by the American Institute of Aeronautics and Astronautics (AIAA). What drew you to JICS? Glasby: I saw JICS as a strategic opportunity to leverage and communicate lessons learned from UT/JICS/Oak Ridge in the context of massive supercomputing and then tie it into our research, which could involve not only DoD but also DoE and NASA. Our project findings will be extended back to our sponsors and other more traditional CFD aerospace-type government organizations. I knew JICS to be a great working facility with access to modern supercomputers. And, of course, the close proximity to Oak Ridge National Laboratory [ORNL] would be beneficial for discussions regarding potential technical issues. What types of expertise do your collaborations involve? Glasby: Our work is the combination of physics, mathematics, and computational science. JICS and ORNL have experts in all three of those areas, and in binding the areas together. On the accelerated applications side, we work with Glenn Brook’s AACE group at JICS. On the mathematical and computational science side, we work with a few key members in John Turner’s group at ORNL. In the computational mathematics group, Bobby Phillips is helping to direct us into massively parallel linear algebra such that the math piece of our algorithm will run in DOE-scale supercomputing. We also collaborate closely with Alan Stagg of the Consortium for Advanced Simulation of Light Water Reactors [CASL]. Alan is a long-time CFD developer and practitioner, and we discuss regular CFD issues from his perspective. How does your research translate to real-world applications? Glasby: The end goal would be a virtual wind tunnel in which airflow over a lifting body could be digitally described through modeling that accurately matches the true physics and physical phenomena. A virtual wind tunnel would be more cost-effective than a real one, would it not? Glasby: Sure. If we have a virtual wind tunnel, the cost per test would go down immensely—in fact, a couple of orders of magnitude. The acquisition cost of evaluating a product and the time involved also would be greatly reduced. In addition to contributing knowledge toward the development of a virtual wind tunnel, does your work have an aircraft design component? Glasby: Yes, with simulation-based design, once we prove whether our operands are accurate we can compute sensitivity derivatives such that if one were to perturb the shape of a lifting body, these derivatives could then tell us whether the shape has a positive or negative impact on the overall characteristics of the lifting body—meaning lift, drag, and moment. We look at what the changes are and how they affect the aerodynamic properties of a flying object. What are some of your recent publications? We will be presenting three different papers at the AIAA SciTech conference [January 4–8, 2016 in San Diego]. About JICS: The Joint Institute for Computational Sciences was established by the University of Tennessee and Oak Ridge National Laboratory (ORNL) to advance scientific discovery and leading-edge engineering, and to further knowledge of computational modeling and simulation. JICS realizes its vision by taking full advantage of petascale-and-beyond computers housed at ORNL and by educating a new generation of scientists and engineers to be well-versed in the application of computational modeling and simulation for solving the most challenging scientific and engineering problems. JICS operates the National Institute for Computational Sciences (NICS), which had the distinction of deploying and managing the Kraken supercomputer. NICS is a leading academic supercomputing center and a major partner in the National Science Foundation's eXtreme Science and Engineering Discovery Environment (XSEDE).